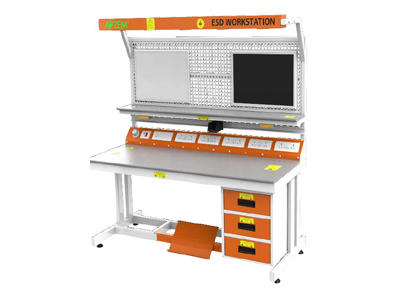 ESD workstation | Electrostatic discharge table | Apzem, India. Apzem Professional series ESD workstation are ergonomically designed, heavy duty ESD workstation for medium to Large electronics Labs and Industries handling ESDS boards and components. Static charges generated by turbo charging or by friction on humans and other insulated materials should be properly dissipated before bringing in contact with sensitive Electronic components and circuits. Apzem Professional series ESD workstation is designed with a aim to provide complete robust ESD safe work environment that boosts maximum productivity and safety to sensitive electronic components and circuits. Construction:: All our Professional series ESD workstation / Table are made of heavy gauge MS sheets and tube structures providing greater strength and longer life. Finish : All ESD table frame structure are treated and powder coated for lasting life. Table Top : :All Apzem professional series ESD workstations are by default provided with one inch thick post formed ESD Laminated marine wood table top. Lighting: Fluorescent / LED light having light intensity greater than 800 Lux for greater visibility and comfort. Grounding: All Apzem ESD workstation work surfaces, wrist straps, ESD floors and Structure are connected to a common ground point and is properly grounded. Monitoring : ESD work surface, wrist strap are continuously monitored via ESD monitor for proper grounding and proper functioning of it. Visual and audio alarm indicates when its not working as intended. Safety : All wrist strap, ESD work surface are connected via 1 mega ohm resistor if its grounded through electrical power outlet grounding terminal, to safeguard user from shocks when ground becomes live accidentally. Storage: All Apzem professional ESD Workstation comes with standard three draw storage cabinet on either side / or on one side on request. Others: We also supply ESD Bins, ESD chairs, ESD shoes, Heel strips, gloves, wrist straps and also ESD safe soldering fume extractor along with our ESD workstation on request. Customization: We provide complete customization to all our ESD workstations to suit your specific needs. Construction: Completely ground, & static safe dissipative. MOC: Carbon steel structure with powder Coated finish. Table top: ESD laminated table top. Power option : Single Phase. Others: Provided with additional power Sockets with switches. Customization : Yes , customization available suiting your needs. All Apzem Products are designed to comply with ACGIH and OSHA standards as well as local PCB Standards. All Apzem Products are minimum one year waranted for performance and quality.